We ordered the set lunch of 3 courses for just £27, and it came with 2 complimentary dishes – definitely getting bangs for our bucks! 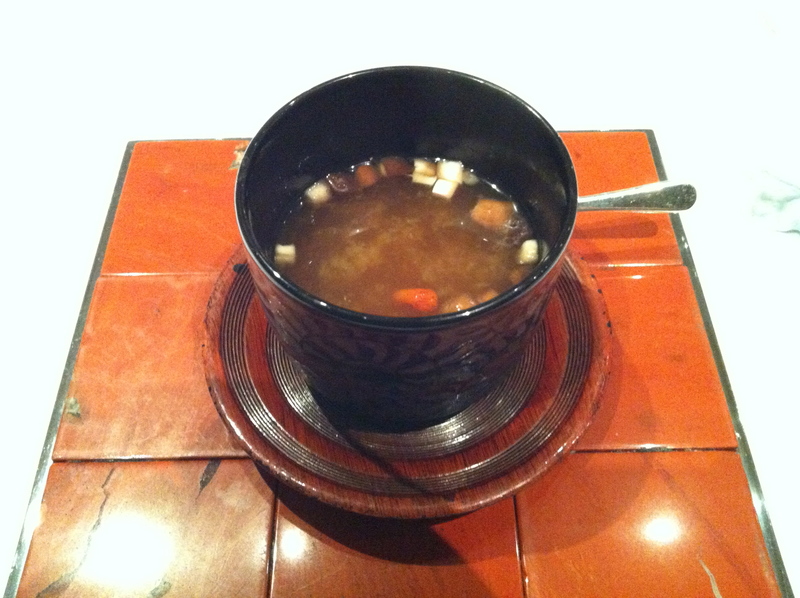 The first dish – a sort of spicy herbal soup as pictured above – was one of the complimentary dishes. Visually simple, it certainly gave my taste buds a rude awakening. Being a person who is more susceptible towards spiciness than the general population, I found this soup a tad too strong. They do however say that it is a good way to start a meal spicy as spiciness enhances your appetite and hence makes upcoming dishes seemingly more delicious, which may be what Kai is aiming for. 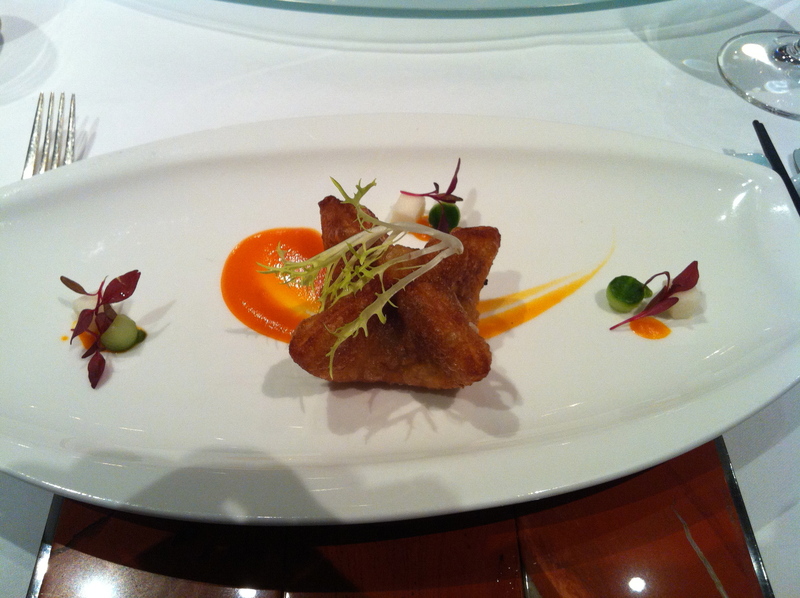 The starter I ordered (pictured above) was the Deep Fried Veggie Dumpling with carrot puree. Not only was it visually stunning, it tasted like it was made in heaven. The dumpling was perfectly fried to crispness, and the filling inside was moist and flavourful. Though I’m not a huge fan of veggies, this dish really sealed the deal for me. Up next was the next complimentary dish. 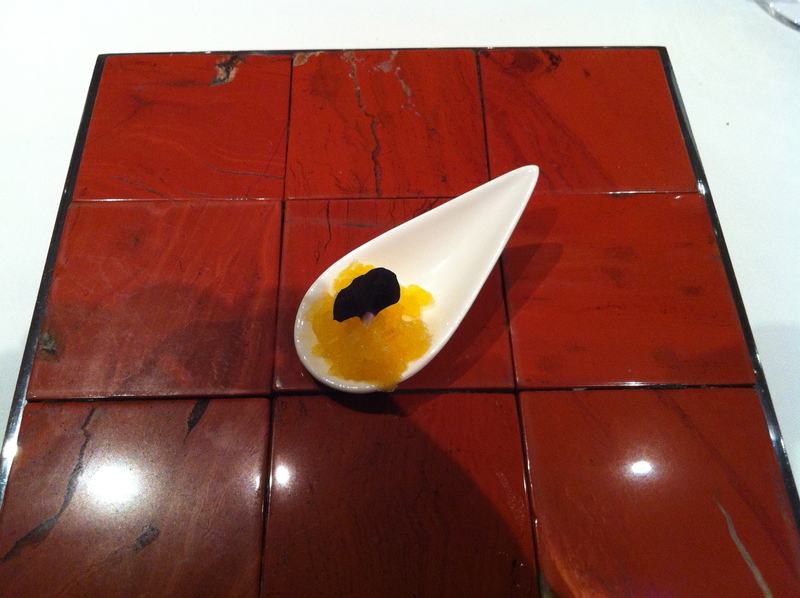 This ‘palette cleanser’ came in a little white tear-drop shaped spoon and was filled with orange-flavoured ice topped with some kind of flower (sorry, I’m no flower expert). When consumed, I was instantly refreshed by the tangy orange flavour and was also pleasantly surprised by the crackling of popping candy in my mouth. Too bad this wasn’t served in a huge bowl: I would have devoured the whole thing! Next came the main course. 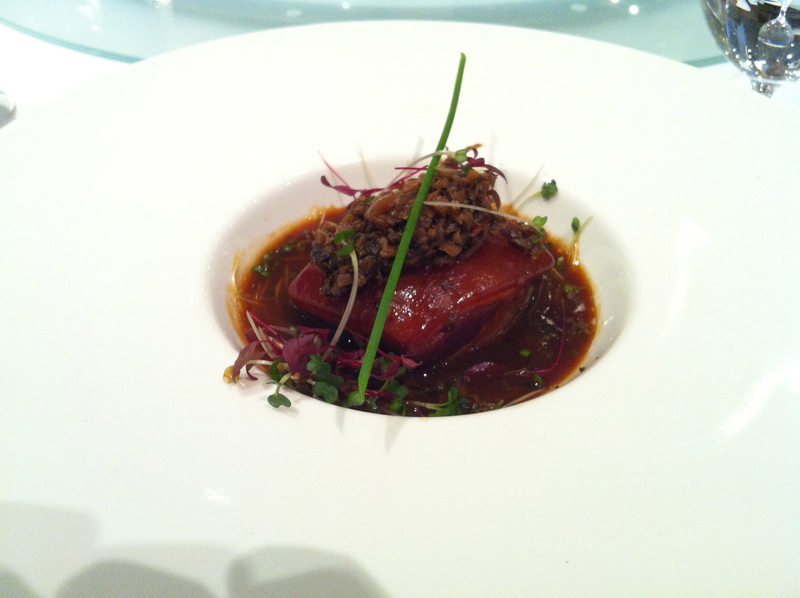 I ordered Slow Cooked Pork Belly which was apparently braised for 5 hours. Sadly, this dish did not live up to my expectations. The pork could have and should have been much more tender if it was braised for 5 hours. The taste was definitely there and I’ve no complaints about that, but as a the main course, it certainly failed to impress. It made me regret not ordering the sirloin steak. Shame. Finally, dessert was served! I ordered the Coconut and Lychees, pictured above. The plating was definitely unique for a dessert, but more impressive was its diversity in flavour and textures: they went so well together like an orchestra. 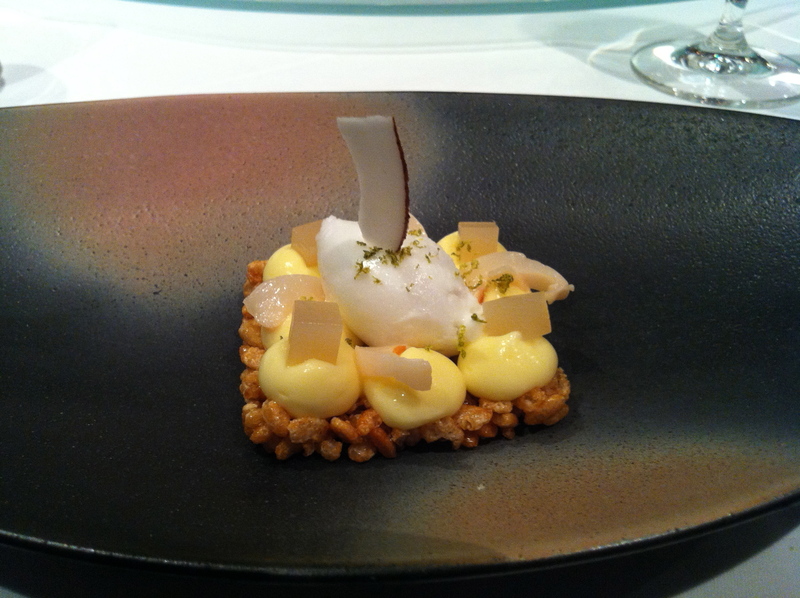 The soft and cool coconut sorbet, the sweet and juicy lychee slices, the spongy jelly cubes, the smooth and velvety vanilla cream, and the crunchy and crispy rice biscuit at the bottom all came incredibly well together. Simply amazing. In all, the set lunch at Kai is worth a visit. However, unless you’re a huge piggie fan, don’t order the pork belly unless you like to chew. A lot. The starter and dessert saved the day for me though.